Tea of Life is a newish brand featured on Tea Amigos and so far it has delivered some interesting and delicious chai teas. 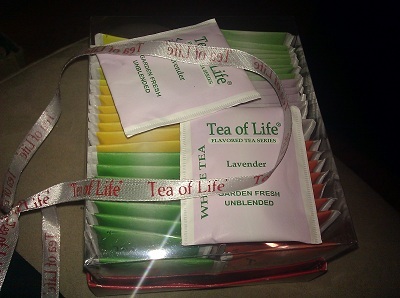 The Tea of Life Lavender White tea is not that interesting or out of the ordinary but a solid daily drinker. I honestly don’t have too much to say about it. Nothing stands out in particular, just a nice staple tea to have in the mornings. The scent of lavender is present and not overwhelming. The white tea base feels a little lackluster, not like it’s bad but more that it can use a little more character. Tea of Life Lavender white tea is a spare but not a strike (and definitely not a turkey). Tea of Life White Lavender tea is like a golden retriever, straight up mediocre. Not dissing anybody that has a golden retriever, but to me that dog, similar to this steep, barks mediocrity. I took my nose to the sachet…nothing. First aroma once the H20 got involved…nothing. I even thought I oversteeped it because something became immediately more important…not even bitter. This white lavender tea even fails at failing. At least it is drinkable. I’d recommend giving this tea as a secret santa gift. To give it credit though, this is a tea brand that I found at Marshall’s, so “gourmet” is not its first name. “Life” is its last name though, and that’s what I’m gonna have to go on with, cuz this was meh as a mofo.